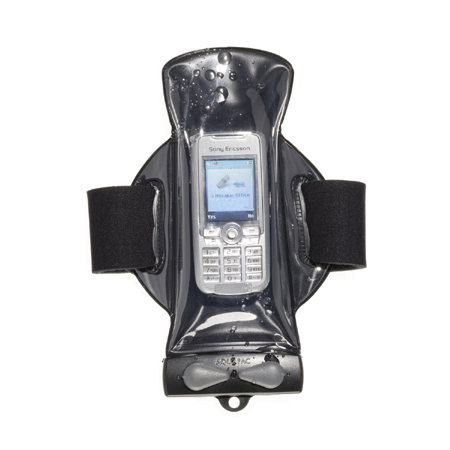 You can make and receive phone calls and use your GPS as normal through the case Guaranteed submersible to 15ft/5m the case also protects your equipment from dust, dirt and sand The airtight seal allows your equipment to float safely on the water's surface An Armband allowing you to strap the case to your arm or your equipment - so you can enjoy your activity hands-free. An adjustable neck cord so you can also tie the case to your equipment or just hang it on your shoulder. Dimensions for the maximum size of equipment to fit in case: Length 6in/155mm; Circumference 6in/155mm. The elastic and Velcro armband that comes with the case is 37cm/14.6 inches long.